When space tourists finally launch on Virgin Galactic's commercial spaceships, they could look like extras from the 1979 James Bond film "Moonraker," according to exclusive information obtained by SPACE.com. Unlike Russia's Sokol spacesuit or NASA's bright orange space shuttle launch and re-entry pressure suits, Virgin Galactic's customers are to wear personalized flight suits, soft-soled shoes and a soft flight helmet that contains headphones and a microphone. The helmet will be able to have an oxygen mask attached, in the event of an emergency. 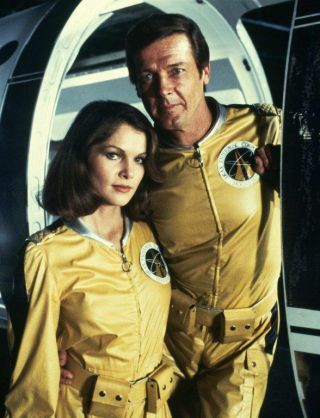 In the film nominated for an Oscar for its zero-g special effects, "Moonraker's" space shuttle flight scenes saw 007 actor Roger Moore wear a flight suit and soft helmet with headphones and a microphone. In the movie, European billionaire Hugo Drax launches shuttles from South America to send carefully chosen "perfect" people into space where they will create a master race to repopulate the world. In real life, European billionaire Sir Richard Branson plans to launch his SpaceShipTwo suborbital spacecraft from North America carrying passengers paying hefty ticket prices. "Our customers will certainly have customized flight attire and a communications suite," Virgin Galactic's chief executive officer George Whitesides told SPACE.com. "Personal protective equipment is being studied as a part of the flight test program." The spaceline's chief medical officer, Dr. James Vanderploeg, explained the reason for choosing soft soled shoes and a soft helmet for Virgin Galactic flights. The padding and lack of hard edges will help ensure the six floating space tourists inside SpaceShipTwo's business-jet sized cabin interior don't injure themselves or their fellow passengers, Vanderploeg told SPACE.com at the International Academy of Astronautic's Private Human Access to Space Symposium in Arcachon, France this summer. Whitesides agreed. "We're putting a lot of thought into how we make sure the zero-g portion of our customers' experience is safe," he said. The flight wear "is an area where we continue to look at different options." Whitesides and his chief medical officer hope their customers' spacesuits can one day benefit from built-in health monitoring devices. Vanderploeg is researching such technology for a U.S. Federal Aviation Administration program, where he is participating as a faculty member of the University of Texas Medical branch at Galveston, not through Virgin Galactic. Spaceport America, the commercial spaceflight facility in New Mexico where Virgin Galactic will make its flights, will have an emergency medical team waiting to deal with any in-flight emergencies and to transport customers to a medical facility immediately after SpaceShipTwo lands, if necessary, Vanderploeg added. Branson has enjoyed an association with the global brand that is 007. Branson had a cameo appearance in the 2006 Bond film "Casino Royale," and Daniel Craig's Bond flew Virgin Atlantic in the last film, "Quantum of Solace." A Virgin Atlantic television ad shown worldwide in late 2010 aped the Bond movies' title sequence style. However, Branson might not want to be associated with the 23rd Bond film to hit cinemas in October 2012, as its rumoured title is "Skyfall."